From Endurance to The Home Of the Blizzard, from	Scott and Amundsen to To the Ends Of the Earth, we can help you find the polar books you are looking for. As the world's largest independent marketplace for new, used and rare books, you always get the best in service and value when you buy from Biblio.com, and all of your purchases are backed by our return guarantee. APSLEY CHERRY-GARRARD (1886-1959) was one of the youngest members of Captain Scott's final expedition to the Antarctic which he joined to collect the eggs of the Emperor penguin. After the expedition, Cherry-Garrard served in the First World War and was invalided home. With the zealous encouragement of his neighbour, George Bernard Shaw, Cherry-Garrard wrote The Worst Journey in the World (1922) in an attempt to overcome the horror of the journey. As the years unravelled he faced a terrible struggle against depression, breakdown and despair, haunted by the possibility that he could have saved Scott and his companions. Pierre Berton was one of Canada’s most popular and prolific authors. From narrative histories and popular culture, to picture and coffee table books to anthologies, to stories for children to readable, historical works for youth, many of his fifty books are now Canadian classics. Born in 1920 and raised in the Yukon, Pierre Berton worked in Klondike mining camps during his university years. He spent four years in the army, rising from private to captain/instructor at the Royal Military College in Kingston. He spent his early newspaper career in Vancouver, where at 21 he was the youngest city editor on any Canadian daily. He wrote columns for and was editor of Maclean’s magazine, appeared on CBC’s public affairs program “Close-Up” and was a permanent fixture on “Front Page Challenge” for 39 years. He was a columnist and editor for the Toronto Star and was a writer and host of a series of CBC programs. Pierre Berton received over 30 literary awards including the Governor-General’s Award for Creative Non-Fiction (three times), the Stephen Leacock Medal of Humour, and the Gabrielle Leger National Heritage Award. He received two Nellies for his work in broadcasting, two National Newspaper awards, and the National History Society’s first award for “distinguished achievement in popularizing Canadian history.” For his immense contribution to Canadian literature and history, he was awarded more than a dozen honourary degrees, is a member of the Newsman’s Hall of Fame, and is a Companion of the Order of Canada. Pierre Berton passed away in Toronto on November 30, 2004. From the Hardcover edition. In 1914, as the shadow of war falls across Europe, a party led by veteran explorer Sir Ernest Shackleton sets out to become the first to traverse the Antarctic continent. Their initial optimism is short-lived, however, as the ice field slowly thickens, encasing the ship Endurance in a death-grip, crushing their craft, and marooning 28 men on a ploar ice floe. In an epic struggle of man versus the elements, Shackleton leads his team on a harrowing quest for survival over some of the most unforgiving terrain in the world. 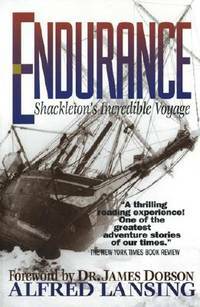 Icy, tempestuous seas full of gargantuan waves, mountainous glaciers and icebergs, unending brutal cold, and ever-looming starvation are their mortal foes as Shackleton and his men struggle to stay alive. What happened to those brave men forever stands as a testament to their strength of will and the power of human endurance. This is their story, as told by the man who led them. The untold story of the last odyssey of the heroic age of Antarctic exploration Sir Ernest Shackletons 1914 Antarctic endeavor is legend, but for sheer heroism and tragic nobility, nothing compares to the saga of the Ross Sea party. This crew of explorers landed on the opposite side of Antarctica from the Endurance with a mission to build supply depots for Shackletons planned crossing of the continent. But their ship disappeared in a gale, leaving ten inexperienced, ill-equipped men to trek 1,356 miles in the harshest environment on earth. Drawing on the mens own journals and photographs, The Lost Men is a masterpiece of historical adventure, a book destined to be a classic in the vein of Into Thin Air .